In need of Auto Repair, Scheduled Maintenance, or an Inspection? Kranz Auto is here. Call or Stop By Our Shop Anytime During Business Hours and We Will Do Our Best to Service You Promptly. 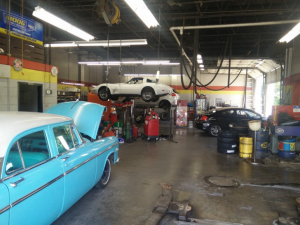 Kranz Auto Repair is a family owned and operated auto repair shop that has been serving the Barrington Illinois area for well over 70 years. Our highly trained team of mechanics have the necessary experience repairing and installing new auto equipment in to your vehicle. This is a great shop and they are super knowledgeable. Tom Kranz is the owner and a super guy. He’s got a great team and they get the job done fast and correct the first time. If you live in the Barrington area and your vehicle needs work, I highly recommend using Kranz Automotive. Great service station! Trust them fully with care, prices and overall quality. Tom is great, trustworthy guy and I’ve been going to him for years (I find trouble trusting a automotive shop as a woman driver). Quick service as well, thanks Kranz Auto! I have been taking all my cars to Kranz for over a decade. Tom Kranz is a straight shooter – he has talked me out of repairs that would have made him money but not be in my best interest. The work I have had done ranges from simple oil changes to things like replacing a timing belt, new clutch, brakes, etc. I TOTALLY trust Tom and his expert staff with my car!